Randolph Peaches N Cream offers a friendly atmosphere where customers will find fresh produce, beautiful plants, Amish goods and great ice cream. They open the week before Easter, selling Easter plants. 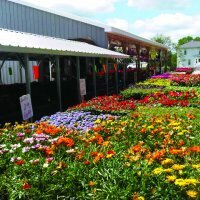 Hanging baskets and perennials are added before Mother's Day, with cemetery urns, bedding and vegetable plants, seeds and onion sets available for Memorial Day. The Ice Cream Shop offers 32 flavors, sudaes, shakes, flurries, and homegrown fruit when available. The enclosed market stand offers pickled products, licorice candy, soups, dips, chocolates, noodles, jams, seeds, and cheese. Once the local harvest season begins, everything is grown locally; including strawberries, sweet corn, peaches, peppers, tomatoes, cucumbers, squash, broccoli, cauliflower, onions, plums and watermelons. They grow their own flowers, vegetable plants and baskets. Pumpkins, gourds, hardy mums and apples are sold in fall. Wreaths, poinsettias, Douglas firs and Frazer firs are sold in November. Customers are welcome to browse through the store while they enjoy their ice cream or sit and relax at picnic tables to enjoy the scenic view. Or stop in for one of their events! They have a Cruise-In at the end of August and a Giant Pumpkin Contest in October. Also, once a month they have an "era" night- 50's, 60's, 70's, and 80's night. Business hours: Open Easter to Christmas, 7 days per week, 10am - 9pm. Closed from November 1 to Thanksgiving.